There's just something shiver-inducing about crawling animals like insects, arachnids and centipedes. And the bigger they are, the creepier they get. So, just to start your weekend off right, here are some of the world's biggest creepy crawlies. Before we start, let's specify what we mean by "crawling animals." For the purposes of this list, we will only be looking at terrestrial (land-living) arthropods — invertebrates with pairs of jointed appendages, a segmented body and a hard exoskeleton. We will also focus on creatures whose primary mode of movement is crawling. The coconut crab (Birgus latro), also known as the robber crab, is a species of terrestrial hermit crab — which, by the way, are not "true crabs" — and the largest land-living arthropod in the world. It's found on a number of islands throughout the Indian and western Pacific Oceans, including Christmas Island, Fiji, Malaysia and Samoa, according to the IUCN Red List of Threatened Species. These monstrous crabs can weigh up to almost 9 pounds (4 kg) and have a carapace that's 3 inches in length and almost 8 inches in width. They are opportunistic omnivores with a penchant for — you guessed it — coconuts. They have been known to actually climb trees to cut down coconuts if none are available on the ground. With a lot of time and help from friends, a coconut crab is actually able to open an undamaged coconut with its powerful claws, according to some reports. Other vegetative food sources include Indian almonds, Tahitian chestnuts and fruit from the Arenga palm, among many others, though coconut crabs have also reportedly eaten various carrions, such as flying foxes, turtle hatchlings and birds. At times, they may even hunt for live meat, including each other, Christmas Island red crabs and even wild rats that stumble into their burrow homes. At around 1 foot long, the Amazonian giant centipede, or Peruvian giant yellow-leg centipede, certainly earned its scientific name, Scolopendra gigantea. Widely considered the largest species of centipede on Earth, S. gigantea can be found in South American and the Caribbean, including northern Colombia and Venezuela, Trinidad, Isla Margarita, Curaçao, and Aruba. Research on the giant invertebrate is relatively scarce, but Scolopendra centipedes are known to prey on anything they can kill, including frogs, toads, lizards, snakes, sparrow-sized birds and rodents. In 2005, researchers documented S. gigantea climbing to the roof of a cave in Venezuela and catching bats mid-flight. The centipede packs potent venom, able to kill small prey almost instantaneously. The venom is also toxic to humans and a bite from S. gigantea can results in intense pain, blood clots at the puncture sites and local hyperthermia, though it's not strong enough to kill a human infant. The largest species of weta (an insect related to grasshoppers) is Deinacrida heteracantha, more commonly known as the Little Barrier Island giant weta, or the New Zealand wetapunga. A couple of years ago, retired park ranger Mark Moffett found a pregnant female specimen that was a few inches long and weighed 2.5 ounces, which is about three times the weight of your typical house mouse. That particular weta specimen is the largest single insect that's ever been found, though D. heteracantha doesn't typically get nearly that big — the title for largest insect would generally go to one of a few beetle species (below). The wetapunga could once be found throughout Northland and Auckland of New Zealand, but it is now restricted to the forests of Little Barrier Island, also known as Hauturu. They are a flightless, slow moving, mostly arboreal species that feeds on a range of plants (carrots apparently included) at night and hides during the day. Several species of beetles vie for the crown of the largest beetle species in the world. According to the University of Florida Book of Insect Records, the contenders are: Goliath beetles (Goliathus goliatus pictured above, and Goliathus regius), elephant beetles (Megasoma elephas and Megasoma actaeon) and the Titan beetle (Titanus giganteus). Based on maximum body length, the clear winner is the South American Titan beetle (which is a actually a flying species, but we'll overlook that) at around 6.5 inches long. But if we really want to be technical, another beetle species, the Hercules beetle (Dynastes hercules), could be considered the largest beetle because its exceedingly long horns help it reach the 7-inch mark. Figures such as 100 grams for Goliathus (species not specified) versus a mere 35 grams for Megasoma elephas are interesting of themselves, but have no comparative value whatever. Was the decimal misplaced, 35 grams to 3.5 ounces? Or, more probably, was 35 grams misquoted as 3.5 ounces and the unknown Goliathus, in fact, weighed 35 grams? Neither length nor width, let alone feeding condition, was given for the above-quoted Megasoma weight. An average-sized living specimen of M. actaeon measuring 10.3cm was reported to weigh 36 grams. By a straight math comparison, that equals about 47 grams for a maximum M. actaeon. A large living Goliathus goliatus of approximately 10cm total length was recently reported to weigh 42 grams. The same extrapolation of data applied to actaeon would produce a figure of about 45 grams for a living 11cm Goliathus. Beetles and weta may contend the for largest insect title, but the longest species of insect in the world is the stick insect, Phobaeticus chani, also known as Chan's megastick (no really, that's what it's called). Named after amateur naturalist Datuk Chan Chew Lun, Chan's megastick has a 14-inch body and a total length of 22 inches when its legs are stretched out, according to the Natural History Museum. Only a few specimens of Chan's megastick have been found so far, so very little is known about the species. Scientists think the species appears so elusive because they likely live in the forest canopies of Borneo. What is known, however, is that their eggs are pretty damn cool: They have wing-like extensions on both sides, which probably allows the eggs flow in the wind, helping the species spread its range. The giant burrowing cockroach (Macropanesthia rhinoceros) is the world's heaviest cockroach. M. rhinoceros, which is also called the rhinoceros cockroach, weighs up to about 1 ounce and reaches almost 3 inches in length, according to the Queensland Museum. The flightless Australia natives use their spiny legs to dig burrows down into the soil that are several feet deep; at night, they emerge from their cozy homes to forage for dry leaves to eat. Unlike some other cockroach species, the rhinoceros cockroach supposedly makes great, decade-long pets. Though certainly outweighed by M. rhinoceros, the flying Central American Giant Cockroach (Blaberus giganteus) is the longest cockroach species in the world. They are primarily found in Central and South America and can reportedly grow up to 6 inches long. In the rainforest, they can be found crawling around on trees and the ground, gobbling up decaying plant matter, including roots, leaves and debris. Pictured above, the giant huntsman spider (Heteropoda maxima) is a cave dwelling species originally discovered in Laos in 2001. Though its body measures less than two inches long, it is considered the biggest spider in the world because of its 12-inch leg-span. 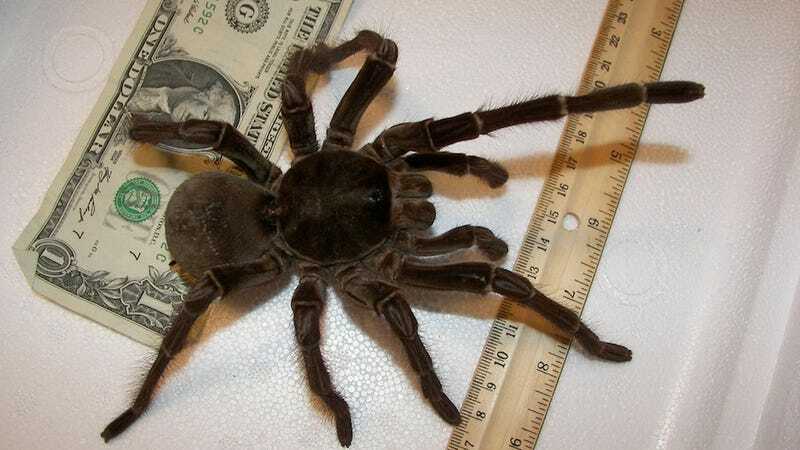 By contrast, the goliath birdeater (Theraphosa blondi) grows to slightly less than 1 foot across, but it weighs over 6 ounces, making it the largest spider by mass. The goliath's inch-long fangs can inject venom that causes pain, nausea, and profuse sweating in humans. A native of the remote rainforests of South America, T. blondi is an ambush predator that lays down a kind of silk tripwire, which allows the spider to detect any prey that stumbles into its domain. According to the Smithsonian National Zoological Park, the goliath birdeater has another odd weapon it uses against any creature it thinks is a threat: Hairlike setae. When threatened, it will release into the air these almost invisible hairs, which irritate the skin, among other things. The tarantula can also make a loud noise, which can be heard from 15 feet away, by rubbing its legs together. True to its name, the spider has been known to eat young birds, though such occurrences are pretty rare. Like the Amazonian giant centipede, T. blondi likes to dine on a number of small creatures, including insects, amphibians, snakes, lizards, rodents and bats. Bugs are insects, but not all insects are bugs. That is, "true bugs" belong to the insect order Hemiptera, or sometimes more specifically to the suborder Heteroptera. The largest true bugs of the world are in the family Belostomatidae, also know as giant water bugs (also: electric light bugs, toe biters, fish killers and other fun names). Giant water bugs are generally pretty large, with many species averaging around 2 inches, though some can grow to more than 4 inches in length. What's especially striking about these insects, which are found on every inhabited continent, is their varied diet that includes insects, snails, fish and other creatures. They are fierce predators that have reportedly even bit humans — their toxic saliva can cause immense pain and hypoesthesia (reduced sense of touch or sensation) that can last for several hours. In 2011, a researcher caught a male giant water bug Kirkaldyia (Lethocerus) deyrolli snacking on a baby Reeve's pond turtle. In the past, he's also photographed giant water bugs eating snakes. Pinpointing the largest ant species is tricky because ants of different castes are different sizes, with the queens being typically the largest. The biggest ants of any species are queen driver ants (Dorylus), which can grow up to 2 inches long. But ants with the greatest average size are giant Amazonian ants (Dinoponera), in which workers measure 1.2 to 1.6 inches long. Interestingly, there are no queens among giant Amazonian ants, which are found only in South America — in this genus, female workers mate with non-nestmate males. Though there are no queens, a hierarchy does exist among the worker females, and only the alpha female is allowed to mate (until she dies and the beta female takes her place). The foraging and nesting behaviors of each Dinoponera species is slightly different. A study in 2002 found that a single Dinoponera gigantea colony may use multiple nests (with no mounds) that have multiple entrances to their underground chambers. The diet of D. gigantea, as with other giant Amazonian ants, consists mainly of scavenged invertebrates, but it also includes live invertebrates, seeds and fruits. Despite being large and packed with strong venom, Dinoponera aren't quite the top of the food chain in their little ecosystem — they regularly fall prey to fungi and parasitic wasps, among other things. Know of any other giant creepy crawlies? Post them in the comments (with pictures, if you can find any!). Top image via snakecollector/Flickr. Inset images: U.S. Fish and Wildlife Service, todbaker/Flickr, William Stovell and Zoe Stone/Wikimedia Commons, H. Zell/Wikimedia Commons, Philip Bragg via ASU, Drew Avery/Flickr, insecta62/Flickr, NoiseCollusion/Flickr, Didier Descouens/Muséum de Toulouse/Wikimedia Commons.